This fresco and its copy came from Villa Lemmy near Florence in 1873, which belonged to the family of Thornabuoni, the friend of the Medici. It is supposed that it was written between two large paintings “Spring” and “The Birth of Venus” and is one of the surviving ones. 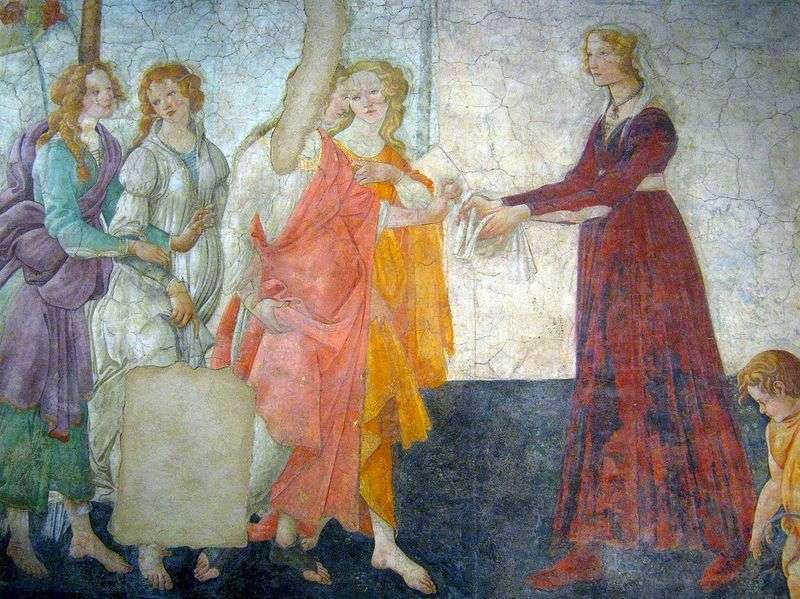 They were ordered to the wedding of Lorenzo Tornabuoni and Giovanna Albizzi Frescoes were damaged when separated from the wall, but we see Giovanni Albizzi, who receives gifts from Venus and, always accompanying her, Three Graces. Venus puts roses – a symbol of beauty and love, and white fabric – a symbol of purity of the bride. The earthly world, symbolized by the girl, is contrasted, in its simplicity and clarity, to the air figures of mythical heroines. Description and meaning of the painting Venus and Three Graces give gifts to the girl by Sandro Botticelli.